On Sale Now! Save 2% on the Wholesale CASE of 5 - HON Optional Height Adjustable T-Arm Set-Adjustable Arm Kit, T-Arms, For 5900 Series, Black by HON at Momiji Studios. MPN: SPRICHPAG08443PAS. Hurry! Limited time offer. Offer valid only while supplies last. Adjustable-height arms attach easily to HON 5900 Series ComforTask Chairs. Design features built-in height adjustment and soft elastomer arm pads. Adjustable-height arms attach easily to HON 5900 Series ComforTask Chairs. Design features built-in height adjustment and soft elastomer arm pads. 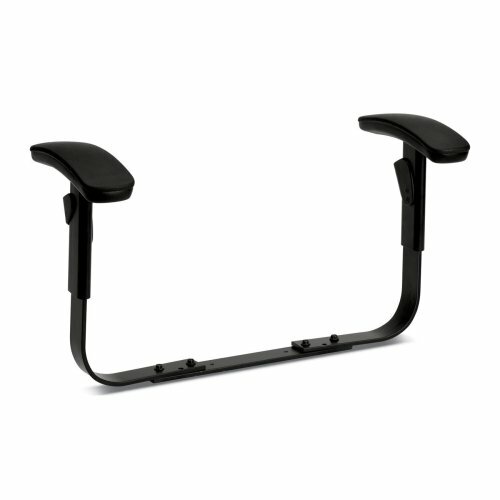 Each arm is independently adjustable for height from 6 to 8-1/2" from the seat. Arm height adjusts in 1/4" increments with a range of 2-1/4". Adjustable-height arms are made of steel with a black powder-coat finish.